They are doing a Beer Passport in February as part of their FeBREWary celebration. The breweries, Moonlight, Plow, Cooperage and Fog Belt will be running a shuttle, picking up people at the Smart Train and then taking them around the breweries. This is their third year of the Beer Passport promotion. Brad has brought a commemorative medal that people can earn by visiting 9 of the 12 breweries on the list. They are all Santa Rosa breweries. The Passport looks like a map and can be stamped at any of the participating breweries. There is a welcome center in Railroad Square. This is a tie-in with SF Beer Week, which Visit Santa Rosa also sponsors. 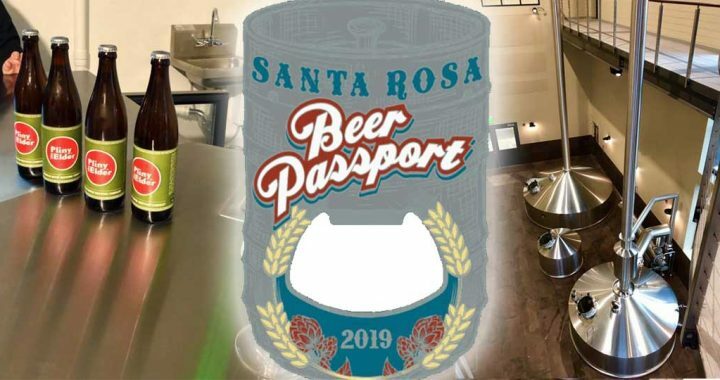 Then, Santa Rosa Beer Passport runs for the rest of February. Pete Foppiano talks about how the president’s government shutdown has affected the brewing industry. The breweries can’t get the TTB to approve their labels. Mark explains that if you want to sell beer across state lines, you need to comply with federal law (but not if you are making and selling only inside your state). The lack of government operations means that the summer brews will be delayed. SF Beer Week has something like 1000 events going on. Santa Rosa brewers are adding events to SF Beer Week. The first two weeks of February will also see the release of Pliny the Elder at Russian River Brewing Co. They get a visit from Seismic Brewing with a growler of their American Robust Porter. Bittersweet cocoa and toasty coffee flavors abound. Mark Carpenter says that oysters are the classic pairing with this beer. You can get your Beer Passport at any of the participating breweries and at their Santa Rosa Welcome Center. Mark mentions that he had an excellent beer called Drake’s 1500, at Nick’s Cove. Herlinda also mentions Flagship February, a celebration of the breweries that started it all, like Anchor Steam and Sierra Nevada Pale Ale.